Two silent movie classics come to Blu-ray in new, restored editions. 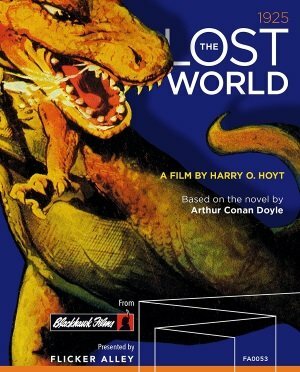 Every larger than life creature feature, from King Kong to Godzilla to Jurassic Park owes a debt to the original The Lost World (1925), the granddaddy of giant monster movies. Based on an adventure fantasy by Arthur Conan Doyle, it’s the story of a maverick scientist and explorer, Professor Challenger (Wallace Beery under a bushy beard), who reports on a land that time forgot on a plateau deep within the South American jungles. When what passes for the National Geographic society jeers his presentation, which is delivered with no evidence, gentleman adventurer and big game hunter Sir John Roxton (Lewis Stone) proposes a new expedition and volunteers to go along. The team is filled out with a somewhat elderly scientist (Arthur Hoyt), a reporter (Lloyd Hughes) representing the paper financing the trip, and the lovely Paula White (Bessie Love), whose father disappeared in that plateau on a previous trip.